Countless unread corporate emails, an obsessive boss, my loving family, and the Denver skyline — all slowly disappeared in my rearview. Ahead of me, six riders from different walks of life, all with a common focus; the Wyoming National Parks; and the miles ahead of us on a collection of Triumphs. It wasn’t long after breakfast in Fort Collins that we diverged from the original plan of taking a beeline route to Thermopolis for the first leg of the journey. No one muttered the words, but we all shared the same opinion: Damn the timeline; let the road guide us as it may. Avoiding the mundane miles I-25 had in store for us, we opted for an indirect route to the Wyoming border by way of a winding ribbon of asphalt that snaked its way through the river valley of Poudre Canyon. With a timetable as the least of our concerns, we stopped often to soak in colorful characters across sparse Wyoming towns. Split Rock Bar and Café in Rawlins, Wyoming, was an unexpected time warp back to a place before free Wi-Fi and a trendy latte selection were pretentious expectations. A bar lined with dusty whiskey bottles that have probably been around since Evel landed his first jump back in 1965, and a pool table that had more miles on it than the rusty pickup truck out front. We could hardly pull ourselves away from this timeless Wyoming watering hole. Across the street at Monk King Bird pottery, a disheveled Byron Seeley eagerly showcased his peculiar handcrafted clay creations. His skin had a terracotta patina only decades of UV exposure and pottery dust could replicate. Seeley embodied an authentic connection with the Earth that only Mother Nature could fully grasp. After a brief stop in the welcoming town of Lander to sync up with a couple of old friends, we carved our way through Wind River Canyon as the sun set, and wrapped up Day One in the novel town of Thermopolis, known simply as the Gateway to Yellowstone Country. As we crested the Continental Divide on the second day, catching our first glimpse of the jagged Grand Teton, the rider ahead of me raised his arms as if to give praise to the glory of these natural wonders. Although tucked away inside a helmet of my own, which meant having no way to communicate with him, I knew what he was feeling at that exact moment: reverence. With our odometers clicking off the miles, we eventually traded steel skyscrapers for metamorphic crag towers. Arriving at what would be our home for the next few days at the Pacific Creek campground just outside of Moran, Wyoming, we scouted the river bank, constructed our tents, and lit the obligatory campfire. Stories of past adventures flowed as effortlessly as the whiskey, and when the laughter eventually dwindled with the last few burning embers, we were left with sounds of nature and an abyss of stars overhead. I found myself alone, staring immensely into the majestic star-filled sky. I had anticipated this moment for some time now, but was hardly prepared for the grand display overhead. My thoughts drifted roughly ten miles upstream, as the crow flies, and 76 years back in time as I recalled a photograph Ansel Adams had taken back in 1942, known simply as “The Tetons and the Snake River.” The photograph is one of 115 image files located on the Golden Records aboard the Voyager 1 and 2 interstellar spacecrafts launched in 1977. The phonographic records containing image and audio information were made as a message in the hope that any intelligent extraterrestrial life forms might be affected by humanity and its position in the universe, even if the likelihood of this is extremely low, and humanity may no longer exist by the time it is discovered. With an estimated lifetime of 500 million years, the records should at least bear witness to the fact that we existed on a planet that I find incredibly beautiful. These records are somewhere out there deep in the universe, and as I lie in the valley cradled by the Tetons, I remind myself of a quote by General Omar Bradley that truly hit home: “...we steered by the stars, not by the lights of each passing ship.” The meaning is simple: It is meant as a reminder to set goals according to things that remain constant and that we can for sure rely on. If we set a course based on moving targets, we’ll never reach our intended destination. I let this sink in and say a prayer or two in hopes of warding off a bear attack before closing my eyes in anticipation of tomorrow’s ride. At that moment, I was unequivocally connected with the Universe. As dawn broke against the Tetons the following morning, and we shook off spirits from the night before, we hustled to get our bikes pointed toward the Yellowstone South Entrance. We had a full day of riding ahead of us, and the sense of exemption that a motorcycle can provide had never been stronger. Throughout our tour of the Grand Teton and Yellowstone national parks, it was as if I had clicked down through the gears of time and slowed to appreciate what has always been here, this grand landscape and the way our national parks system has framed it so well. Struck by the sheer vastness of the nearly 4,000 square miles these national parks encompass, I was reminded of an Eckhart Tolle piece in which he analyzed how we identify with an object through the illusion of ownership: “The absurdity of owning something becomes even more apparent in the case of land. In the days of the white settlement, the natives of North America found ownership of land an incomprehensible concept…They felt they belonged to the land, but the land did not belong to them.” This resonates even more so after experiencing these parks in person. Studying the route on a two-dimensional map filled with borders and boundary lines provided a very limited perspective. But standing there, at the foot of the Tetons, I quickly realized the absurdity behind the concept of owning such a boundless creation. In awe, I willingly surrendered myself to the mountains’ omnipotence. Human history of the Grand Teton region dates back at least 11,000 years, when the first nomadic hunter-gatherers began migrating into the region during warmer months pursuing food and supplies. Grand Teton National Park is an almost pristine ecosystem and the same species of flora and fauna that have existed since prehistoric times can still be found here. Having this knowledge helped me to see this landscape from a unforgettable point of view. Out here, life is neither long nor short. This place is freedom, and this grand show is eternal. Experiencing it all behind the bars of my Bonneville couldn’t have been more gratifying. From the caustic aroma of sulfur pools to the crosswinds sweeping into Hayden Valley, the sensations came at nature’s will, unfettered and pure. Witnessing the connection between this wilderness and humanity was even more apparent through the expressions of wonderment on the faces of both young and old as the crowd’s collective attention focused on Old Faithful erupting yet again, right on time. This was the first journey of its kind for me, and it presented an interesting dichotomy. On one hand, there’s an undeniable sense of individuality when you’re on a motorcycle, a solo pilot in full control of your own personal destiny. 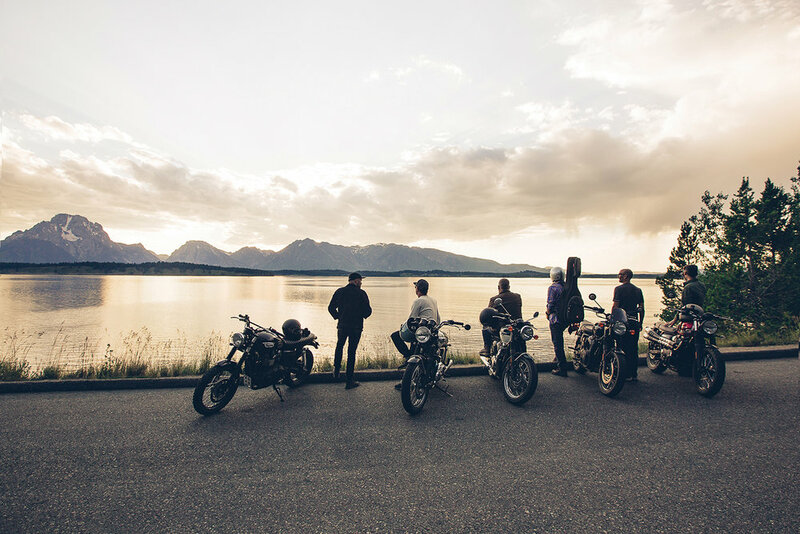 At the same time, there’s that common thread among fellow riders, stitching together a unique tapestry of the visceral experience shared across each and every person in the group. At times, the pack would stretch out, seven riders in tandem equally spaced over a quarter mile; the gap between us was physically apparent as the road would sweep and bend around the Wyoming landscape. However, I knew we were all there in the same space, ever present in the moment. Today’s civilization continues to migrate to these places, but to get our souls fed, instead. Many who have come before us have so eloquently captured the grandeur, whether through the lens of Ansel Adams or the words of John Muir. We are reminded of our connection with what’s existed for millions of years and will remain long after we’re gone. A few days into the excursion, it was time to begin our return trip back to Denver. Back to life as we know it. The road home provided ample time to reflect on the national park experience, with a renewed sense of gratitude and appreciation we headed out through Wyoming’s southern plains and into the Colorado night. Seven of us had come together to venture out with our sights set on a temporary reprieve. We all know that we have a finite time here, yet we have a difficult time living that way, struggling with the transitory nature of our lives. This was an opportunity to put those difficulties aside and to focus on the now, to remind ourselves of how grateful we are to live in this land and in this moment. Because in this wilderness lies the hope of the world.